SHOTS X3 BASS have a signature fun, BASS-HEAVY sound that you'll love. Listen at low volumes and still get that powerful low end thump or turn it up and really hear the bass drop! Everyday and everywhere is a party with Shots X3 BASS. 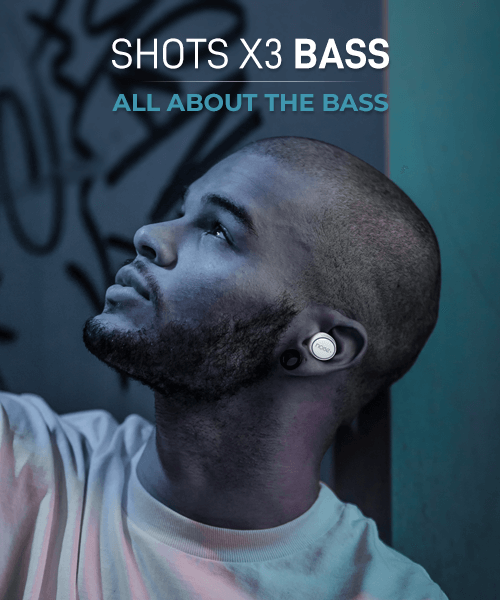 SHOTS X3 BASS earbuds have a clean, minimal design that stands out without sticking out from your ear. You’ll love to hold and show off the magnetic charging case that holds the earbuds. SHOTS X3 BASS are available in 5 stylish colour schemes. High-tech never looked so fashionable. With 3 hours of battery life per charge and more than 10X recharges from the included charging case, you can go up to a week without having to recharge your Shots X3 BASS. The charging case has a built in charge indicator; just tap a button to see how much charge you have remaining. On the phone all day long? Your voice calls will sound as good as your music, with sound in both earbuds; so you can call in noisy environments and still hear clearly. With the latest Bluetooth technology, SHOTS X3 BASS pair faster, have lag-free & dropout-free connections plus greater range than ever before, so you can listen to your tunes all day, without interruptions. Greater wireless range lets you use your earbuds everywhere! and iOS devices, you never have to take your phone out of your pocket. Our products go through multiple levels of Quality Check to ensure that you get the best. But in case, you have any issue with the product, we provide 1 year of manufacturer warranty and excellent customer service. "Buy with confidence, have no doubts"
"I am jaunting down this review after usage of a full day. 1. Sound is awesome. Even the lower frequency are clear. You would love the thump of the bass. 2. Battery back up was decent in one go I could hear for more than 2.5 hours. 3. Build quality is good and light. Fits well in ear even idel for jogging. 4. It doesn't look cheap for the price it's premium. Don't get worried to buy these pair. If you are new to wireless experience this is sure shot go. If company could have given fast charging it would have been ultimate." "Really good in this range!!" I have already been using these wireless earphones from a week now and i can say that these are really good for the price you are paying. These earphones are made from plastic , although they are very lightweight and feels light inside the ear . the case which is used to charge them is also of good quality and it is compact and easily fits inside the pocket. even the cable that you get with these is of good quality. Since these are budget wireless earphones , you should not compare them with rather expensive earphones but still outperforms many in the price range . In terms of sound signature , it is very balanced and i felt no added punch to bass , it was as it should be and i appreciate it . though i would have liked if mids were a litlle more revised nonetheless the sound is really good and you can't complaint. The moment you open the case and take one earphone out , it automatically turns on and connects with your device , you can use it in Mono or both connected at the same time . there is no latency even i games like PUBG. The connectivity is simple and easy and there is no confusion in it. The battery life was also good i would say , i was getting almost 3 hours of batter life at max volume and the case also can charge them like 3-4 times , though i will still be testing it again and updating this review incase i find any changes or observations regarding charging. charging mechanism is also simple and there are LEDs inside the case that makes it easy to know if charging or not. I feel these earphones are good for the price and worth giving a try"
"Just the headphones u need. Buy them with confidence." "Superb sound quality. Value for money"
"Awesome product at such price. It is value for money. I have had used Samsung gear IconX but this earphone is way better than it. Battery life is good and sound quality is top notch." "Awesome product. Noise shots X3 is the perfect choice if someone is planning to buy wireless earphones. These pair of earphones has met all my expectations. Bass and sound quality are also mesmerising." "Amazing sound quality. Great design. Light weight. I'm a basshead and loving the overall sound signature. Lows are punchy and highs can be made more alive and clear(after a bit of tuning). It goes on perfectly with my OnePlus 6 as the sound can be tuned further with the help of the stock equalizer. I've experienced the apple air pods and these are comparable on bass or even better for lower frequencies. Just IMPRESSIVE !!! Great job noise..."
Good battery life for both the headphones and the charging set"
What is the quality of bass? Shots X3 BASS delivers powerful thumping bass. Does the music play in both the ear buds or just one? And while calling does it play in both ears? Shots X3 BASS supports Stereo mode during music and calls which means during the calls and playing music you will hear the sound in both the earbuds. When we receive a call, is it audible in 1 ear or both? You will receive the audio in both earbuds. However, the in-built MIC is placed inside the right earbud. The call quality in Shots X3 BASS is good as long as the network is good and there is no disturbances in the surroundings. Does it announce caller name or number on incoming calls? Yes, it does. However, it depends on the Operating system of the phone. For Android, you have to switch on the feature of announcing the phone number and most iOS smartphones come with the built in feature of announcing the name. While listening to music, I can listen to music clearly but during calls, my voice is very low and the person on other side cannot hear clearly but I can hear their voice clearly. What’s the issue? Since the in-built MIC is inside the earbud that is placed in your ear that’s why it’s advisable to speak a little loudly for your voice to be audible in any surrounding. Can i use it as a single bud while listening to music? Yes, you can. Just switch on the single earbud and pair it with your device. Does it have touch feature to change tracks? No. You have to press the earbuds to change the tracks. Shots X3 BASS does not come with internal memory. The battery up of earbuds is up to 3.5 hours and backed with battery case of 1500mAh, it provides the play time of up to 30 hours. How much does it take to charge? Shots X3 BASS takes about 3 hours to fully charge. Can shots be charged without putting them into the case? No, they cannot be charged without the case. In case, the charger case is not charging, how do we operate the same? Get in touch with our customer care team at 8882132132 or or drop us a mail at support@nexxbase.com with your order id, product image and issues with it. The Shots X3 BASS charging case works as a charging portal and earbuds on the go. They also function as the storage for earbuds. No, there is no active voice cancellation available. How I connect two ear buds in one mobile? Take out the earbuds from the magnetic charging case. Switch them on at the same time. Turn on the Bluetooth in your phone. Choose Shots X3. Shots X3 TWS has now been paired. Does it have buttons to change the music and attend calls? Yes, Shots X3 BASS comes with Multifunctional button to change songs and attend calls. To play or pause the songs, single press the left/right button. Long press the left button to switch to the previous song. Long press the right button to switch to the next song. Noise Shots is IPX4 which means that it is splash resistant and can withstand occasional splash of water. Shots X3 BASS comes with different sized earbuds (S/M/L) for the perfect fit. Since there is no description or detailing given, how would I get to know, what size would be perfect fit? You can try the earbuds and check for the perfect fit and comfort. Can you get me the Green or Fluorescent Color? No, Shots X3 BASS is available in Black Red, Black silver, Black Gold, White Red and White Silver. There is a redial option. Take help from Google support or Siri to redial the last number. What if one ear bud is not working at all? Please get in touch with our customer care team at 8882132132 or drop us a mail at support@nexxbase.com with your order id, product image and issues with it. How do I pair both the pods with an iphone? Take out the earbuds from the magnetic charging case. Switch them on at the same time. Turn on the Bluetooth in your phone. Choose Shots X3. Shots X3 has now been paired. Yes, Shots X3 BASS supports Siri. Are these earpods are compatible with Iphone 6, 6s and 7? Yes, the Shots X3 BASS are compatible with iPhone 6, 6s and 7. Is this compatible with windows so that I can connect it through my laptop? Yes, Shots X3 BASS is compatible with Windows so it can be connected to the laptop as long it is equipped with Bluetooth connectivity provision. Does it connect with led TV using Bluetooth? Yes, as long as you have the provision for Bluetooth connectivity in your TV, you can connect Shots X3 BASS to it. Can it be connected to laptop/computer? Yes, as long as you have the provision for Bluetooth connectivity in your laptop or computer, you can connect Shots X3 BASS to it. What is the sensitivity and hz range? Does it support Bluetooth 4.0 ? Shots X3 BASS is best suited with Bluetooth v5.0, however, it also supports smartphones with Bluetooth v4.0 as well. What is the range of Bluetooth from phone? The Bluetooth range is 30 meters without any obstacle. Is single earbud available as one of them was missing? Only one bud is working, what do I do? Check if the non-working earbud is charged and connected to your device and if it isn’t then get in touch with our customer care team at support@nexxbase.com. Whether you are listening to music, podcast or watching movies, earphones have become an integral part of our everyday life. So, it goes without saying that they have to be comfortable for all day wear and ensure freedom to do activities without anything to hold you back. This is not possible with wired earphones as they come in the way of free movement. That is why wireless earphones have become quite popular in the recent times. At Noise, we have tapped into the ever-increasing demand for these wireless earpods and have come with Shots X3 BASS truly wireless earphones. Why should you choose Shots X3 BASS? Made for music lovers, Noise Shots X3 BASS delivers thumping bass that will have you get lost in the music. With Stereo voice calling feature, attend your calls with ease even in noisy environment. Equipped with Bluetooth 5.0 that allows for crystal clear sound up to a range of 30 meters without any obstacle, you can go about your chores with music playing right into ears. Combined with portable magnetic charging case that also doubles up as a storage unit, enjoy music up to 30 hours. This IPX4 certified earbuds makes daily workout a breeze as it can brave occasional splashes of water. With no wires in sight, you don’t have to waste time in untangling them, simply pair it with your device and enjoy your music. Compatible with both Android and iOS devices, they are a must-have for all music lovers. So, if you want to enjoy music freely then place your buy Noise Shots X3 BASS and get it delivered right at your doorstep with just a few clicks.